Comment: The spine or cover may be slightly worn but the book is otherwise in good condition and will provide thought provoking read! Aged book. Tanned pages and age spots, however, this will not interfere with reading. Damaged cover. The cover of is slightly damaged for instance a torn or bent corner. From mountain bikes to cycle computers, find 1000s of products in our bikes store. Sometimes the hardest part of a journey is knowing when it's over. When twenty-three-year-old Tom Allen and his friends set off from their English village to cycle around the world, they were expecting physical hardship, extreme conditions and a serious case of culture shock. But the hours spent poring over maps could never have prepared them for the experience of life on the road: the petty squabbles, the extreme hospitality, the unexpected joys and dangers. And then Tom meets Tenny, a feisty Iranian-Armenian girl with dreams of her own, and hits a crossroad. Should he give up his grand plan for the girl he loves, or cycle off and risk missing out on the greatest adventure of them all? I have enjoyed reading Tom's cycle touring blog for the past two years. It is definitely one of the best I have come across, expertly written from a wealth of experience. This was the main reason why I couldn't wait to get hold of a copy of his first novel `Janapar'. I was not disappointed. Right from the off I was drawn in and could not put the book down. I was amazed at how different this book was to any other adventure cycling book I had read before. 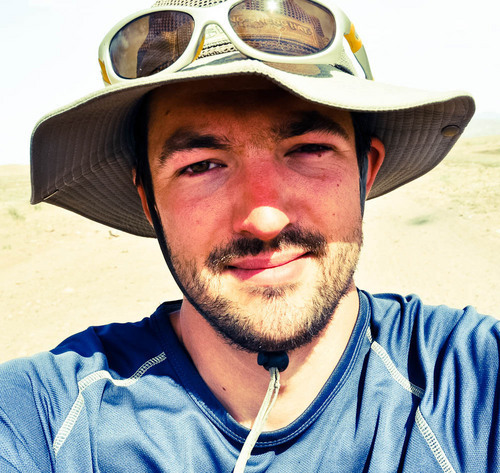 Tom manages to eloquently convey the psyche of being a long distance cyclist, questioning our need and passion for travel. This is much more than a mere travelogue. Tom has clearly poured part of his soul and beliefs into this book, which I admire greatly. It enables you, as the reader, to form a much closer bond with him and the decisions he has to make. I find that the non-linear structure of the book serves to heighten the feeling of suspense. It works well with the two sides of the story, his love on the bike and his love off it. Tom set out in 2007, aged 23, with his two best mates, Mark and Andy. Their ambitious idea was to circumnavigate the planet cycling totally off-road; hence `Ride Earth' was born. Tom and Andy spent a long time pouring over maps sorting out routes and getting that all important sponsorship. However it almost all proved to be useless, no amount of preparation could have equipped them for what they would have to face. The battles for routes, places to stay, and general petty squabbling, life on the road was nothing like any of them had experienced before. Then Tom met Tenny, a feisty Iranian-Armenian girl with dreams of her own, and hits a crossroad. Should he give up his grand plan for the girl he loves, or cycle off and risk missing out on the greatest adventure of them all? 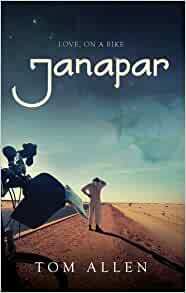 Janapar follows Tom's epic journey cycling around the world and getting much more than he dreamed possible. This is without doubt the best adventure cycling book I have ever read. It offers so much more depth and understanding of life on the road to any other book I have read. Tom tells the story of a tough time in his life when he was confused on which path to take, and the journey on his bike teaches him about himself and about the world around him. It is an eye-opening book which takes you on an adventure far beyond its cover. I've read the book, watched the film, and pored over the blog. Tom's adventures speak to everyone on a personal level and this is a great read. The stark honesty and self criticism is refreshing, the book not only gives you a window into his journey but pulls you in. This has inspired me to go on my own adventure and I assure you it will inspire you in some way. However many 'round the world' cycling books I read, no two are the same. This is a much more personal account of a fabulous journey that includes an unexpected encounter without the whole book being dominated by it. Carefully written with a very private portrayal of the author. 5.0 out of 5 starsA journey around inner thoughts. Strangely captivating. Not so much of how to physically manage long distance cycling, more as how one man psychologicaly managed to cope and adapt to life altering choices and events on his chosen life on the open road. A brave book, a humbling book, a book to dwell upon. Buy it, read it, and read it again. Tom Allen spends several years travelling by bike and writes a book about it - the story is honest, meaningful and interesting. I was unsure about buying the book, having already watched the film. However, I am glad that I did, as the book contains so much more and really adds an extra dimension to the whole story! His trip back through Europe with his wife is just mention, but really non existing apart of English bit. Lack of chronological order can be swallowed, but it didn't go down well at the end. Chaotic jumps in time and space are out of context, there is no need for this. It's not soap opera (is it not? ), it's not criminal neither. Exaggerated love and miss for Tenny, well, I was 23 once and I was in love at the time, but come on, this is XXI century, XIX is well gone now. I don't know how much influence his wife put into the book, but there is not that much about Armenia and Iran, her motherlands, did they have opposite views in these cases? My wife is extremely patriotic and any critique to her country is to be vanished. No jokes allowed. So there is a little bit understanding for that, but explanation would help. Positive side is a language, which is pretty straight, but still deep enough. I liked quite detailed descriptions of part of Turkey, Ethiopia and Djibouti. There is lack of names of the place, which is pretty annoying, you cannot really follow the book on the map. Specially Armenian bit, which is close to me, suffers from lack of geographical facts. I must admit, that I have read Humpreys and Lillwall, so I am a bit bored with postcolonial English twenty something so called travelers, who expect to be understood only because they speak English, no matter how mumbling and fast their talk is. On the other hand I am impressed that he has learned Armenian (I assume alphabet as well, that is really great) and Arabic (at least alphabet). Final word is, that book repeats a movie in few occasions. For me this is unacceptable, there is two things and he should be able not to use the same stuff here and there. I enjoyed reading it, I skipped paragraphs I have heard in the movie and I hope Mr Allen will get better before he commits next book. This one is fairly good, but it should be better, I am sure the story Tom has is a lot richer than what we have.